Description: We grow a wide assortment of both flowering and foliage hanging baskets. 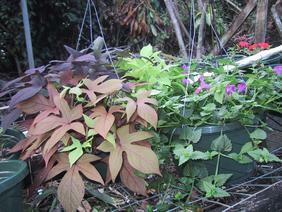 Our foliage assortment includes boston ferns, coleus, and tri-color sweet potato. Our flowering assortment includes torenia, portulaca, Fanfare Impatiens, browalia, angelonia, plectranthus and tomato.